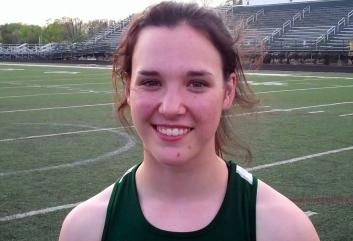 MEDINA, Ohio – The 2011 OHSAA Division I state pole vault champion, Alex Wasik’s impact on the Medina girls track & field team was much more than a first place at Jesse Owens Memorial Stadium. The Villanova University freshman mentored and inspired future Medina track athletes, including junior Jenna D’Errico. Wasik (pictured below), who edged Cloverleaf’s Jennifer Foster for the OHSAA crown with a vault of 12-2, has cleared a personal best of 3.90 meters (12 feet, 9.54 inches) at Villanova. Thanks in large measure to Wasik, and three-time state high jump champion Taylor Burke (now at the University of Florida), the Bees scored 29 points at last year's state track & field meet and tied for fourth place in the team standings. Like Wasik, D’Errico (below) was a gymnast, taking lessons from age 7 to 15, and beginning track in seventh grade. Her personal best is 11 feet. “My plant, that’s my bad habit right now. I have to get my left arm out and just get it into muscle memory,” D’Errico said. A district competitor last year, she has her sights set on the state meet this year. The Medina girls overwhelmed Strongsville, while the Bees defeated the Mustangs boys team 76-57. Walter Bailey won three individual boys events (110 hurdles, 100 dash, long jump) for Medina. Bailey was clocked at 14.3 in the hurdles, 10.7 in the 100 and reached 21-1 in long jump. The Bees won 13 of 17 events. The boys pole vault was the competition of the meet. Strongsville’s Matt Stefano and Bryce Blake each cleared 13-0 to finish 1-2 in that order, while Medina sophomore Kyle Hutchinson also scaled 13-0, but had to settle for third. To have the meet’s top-three finishers go for a combined total of 39 feet is great competition, said Medina boys coach Bob Jenkins.